The Maine Rolled Wool Crusher Hat in Hunter Green is the hat Maine folk used to wear during hunting season before the government made us all wear blaze orange. 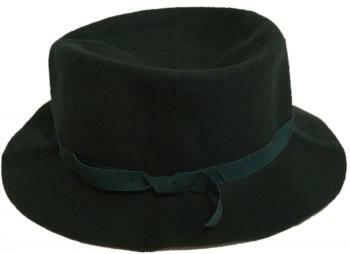 Now the hunter green felt hat is a favorite hat in any season. It goes with everything and goes anywhere. You can wear your hunter green wool crusher hat when you canoe the Allagash, climb Mt. Katahdin, or have a lobster feed down Bar Harbor way. In fact, you’ll even fit right in wearing it in the Old Port in downtown Portland. It’s bendable, crushable, foldable, and always ready when you need a hat quick! Pick your size at checkout.